If you look up into the night sky on a very clear night, in an area with very little light pollution, you will see a band of stars splashed across the sky. That band is the Milky Way, the spiral galaxy in which our Solar System lies, and where almost every object you can see with your naked eye calls home. The Solar System is inside the disk of the Milky Way, and orbits in one of the spiral arms at 26,000 light years from the center of the galaxy. We can’t see the spiral structure of the galaxy from our planet because we are inside the disk and have no means of taking images from above or below the galaxy. Images of the Milky Way’s spiral structure are created from computer modeling based on information from stars as they orbit the galaxy. Much of the Milky Way is invisible to us because we have to look through the plane of its disk – a lot of the Milky Way is on the other side of the galaxy, and there is so much dust and so many bright stars closer to us that we can’t see the stars behind all of this matter. Of the 5,000 to 8,000 stars in the Milky Way visible to the human eye from Earth, one can usually only see about 2,500 at a time. In fact, the few thousand stars we can see of the Milky Way with our naked eye are only about 0.000003% of the 200-400 billion stars that inhabit the spiral! To see a picture of the entire Milky Way from the surface of the Earth at once, you have to create a mosaic of photographs taken at different times. This is because the Milky Way moves overhead at night with the rotation of the Earth, so can’t be viewed all at once from one spot. Many panoramas of our galaxy can be found on the web, but here’s a few to get you started: NASA’s Astronomy Picture of the Day, the Spitzer Space Telescope’s very detailed, very large (55-meters long when printed) mosaic available for your perusal here – it’s a large image, so give it a little time to load – and a drawing by Knut Lundmark of over 7,000 stars in the Milky Way made in the 1950s. 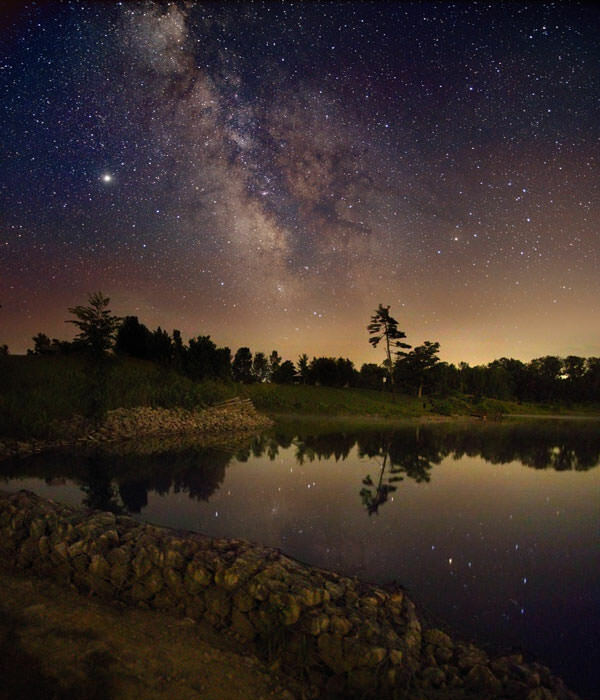 To learn more about the Milky Way, visit the rest of the section here at the Guide to Space, listen to Episode 99 of Astronomy Cast, or visit the Students for the Exploration and Development of Space.